One year later our Whiski succeeded his stablemate with a similar victory. Whiski also won the Kabareta stakes in 1996. Ahmed won the Kurozweki Stakes twice, in 1995 and 1996. Also our young colt Dandy, Waarabi, Cliinntonn and Paultje have won several races. "Korfowe Arabians has become a true new center of Arabian horse breeding in Poland; a meeting and contact point for horse lovers from all over the country and abroad. 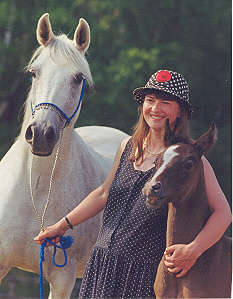 Korfowe Arabians was among the earliest to join the Polish Association of Arab Horse Breeders, whose membership now numbers thirty private Polish breeders. I am the association's secretary and I put out the group's newsletter. "In 1997, we have at stud the dark grey Derby winner Dekor (Fawor x Dekada), as well as two other great stallions, both sons of Bandos; the grey Engar (1971) out of Janow's 'queen' Engracja and the grey Erfurt (1980), out of Michalow's famous Elwira. "